The Star of David Keepsake is available in Sterling Silver (top photo) or Sterling Silver with a 14K Gold Star (bottom photo). 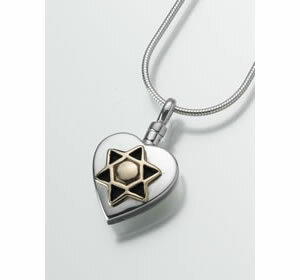 The Star of David measures 1"H x 1"W.
Ashes are added through a screw top opening. Filling instructions, a small funnel, and a care card are included. 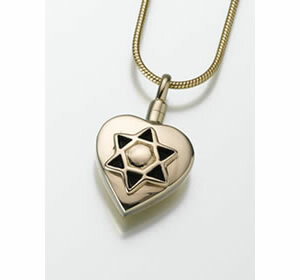 Each pendant is attractively packaged in a black velvet gift box. A free black satin cord is included or you have the option to purchase a Sterling Silver chain.